IMT Solar is a world leader for both the development and production of silicon irradiance sensors used for solar irradiance measurement. Since 1994, we have manufactured thousands of sensors supporting applications for Photovoltaic (PV) installation monitoring, PV cell research and development, PV IV curve measurement, solar thermal installation monitoring and meteorological stations. 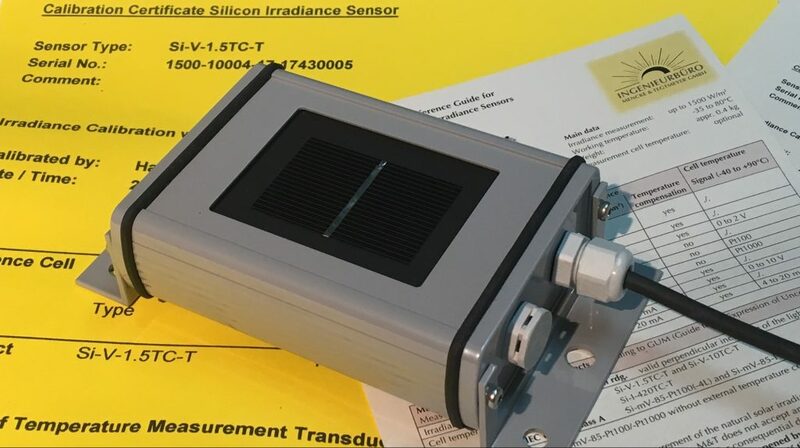 Like other IMT equipment, the success of our silicon irradiance sensors is due to our dedication to deliver a product that is cost-effective, reliable, durable and accurate. Our sensors use a high-quality monocrystalline solar cell connected to a high accuracy shunt. The low shunt resistance causes the cell to operate close to the short-circuit point. To compensate for any possible measurement shifts caused by the temperature co-efficient relationship with the Isc., all of our silicon sensors with the part number extension of “TC” employ active temperature compensation. 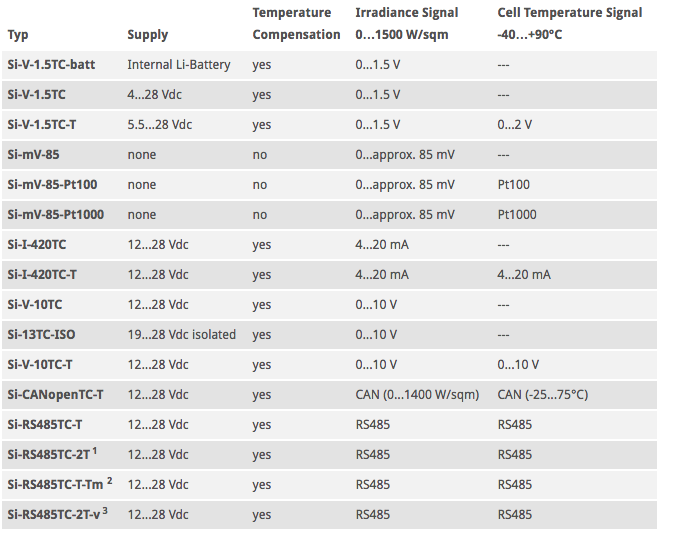 The compensation is realized by using a specific temperature sensor laminated to the rear side of the solar cell. One of the key elements of the electronic compensation circuit design is very low power consumption. The current consumption of our Si-V-1.5TC-batt sensor which is powered by an internal Lithium battery is only about 15 µA. IMT silicon sensors are manufactured in many different configurations to meet the monitoring requirements of almost any system. Sensors are available with an external power supply (Si-V-1.5TC-batt has an internal power supply), with both analog and digital (RS-485) output signals and with or without a sensor output for cell temperature. Sensors can also be purchased with a pre-connected cable or with standard industry connectors for a range of applications. All standard sensors are calibrated using a reference cell calibrated by PTB (Physikalisch-Technische Bundesanstalt). Poly cell sensors are calibrated using a reference cell calibrated by Fraunhofer ISE, Freiburg. Our sensors are built using a powder-coated aluminum case sealed to IP 65. The solar cell is embedded in Ethylen-Vinyl-Acetate (EVA) between glass and Tedlar™. The laminated cell is integrated into a powder-coated aluminum case. This configuration of the sensor is comparable to that of a standard PV module making the sensor an ideal choice for irradiance monitoring of commercial PV installations. The electrical connection for the sensor is realized by an integrated cable or an IP67 rated connector. A cable length of 3 meters is standard for most of our sensors, however other cable lengths can be provided. Our silicon sensors with a “-T” extension to the part number provide an additional signal output representing cell temperature. This temperature is very close to the PV module temperature when mounted on the same plane. Accuracy – for accuracy information please refer to datasheets. © 2019 Solar Irradiance Sensor – Reference Cell – Solar Measurement Equipment – IMT Solar All Rights Reserved.